One Eternal Day: "If a man talks of his misfortunes..."
Boswell saw not merely a great subject in Samuel Johnson, but an exemplar, a teacher, a reality instructor, for the two men were vastly different in outlook, stability and, above all, good sense. Johnson came to love Boswell without ever quite treating him as an equal. “You are longer a boy than others,” he told him when Boswell was in his mid-30s. In Johnson’s eyes, he would remain a boy, always in need of straightening out, through their 21-year relationship, which ended with Johnson’s death in 1784 at 75. Boswell shows us his subject’s gruff table manners, how he walked, his laugh (like that of a rhinoceros), his terror of death, his immense—one can only call it his Christian—generosity to the poor and those defeated by life. ManyBooks.com has made a number of Boswell's works available, free for download for Kindle, etc., including the Life of Johnson. 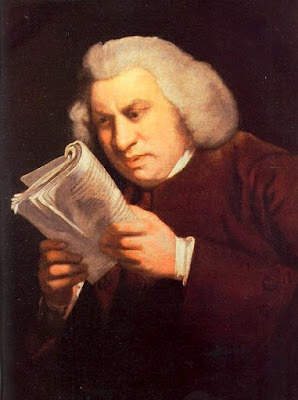 Yale has put the "Works of Samuel Johnson" online. "Sir, are you so grossly ignorant of human nature, as not to know that a man may be very sincere in good principles, without having good practice?" O LORD, my Maker and Protector, who hast graciously sent me into this world, to work out my salvation, enable me to drive from me all such unquiet and perplexing thoughts as may mislead or hinder me in the practice of those duties which Thou hast required. When I behold the works of Thy hands and consider the course of Thy providence, give me Grace always to remember that Thy thoughts are not my thoughts, nor Thy ways my ways. And while it shall please Thee to continue me in this world where much is to be done and little to be known, teach me by Thy Holy Spirit to withdraw my mind from unprofitable and dangerous enquiries, from difficulties vainly curious, and doubts impossible to be solved. Let me rejoice in the light which Thou hast imparted, let me serve Thee with active zeal, and humble confidence, and wait with patient expectation for the time in which the soul which Thou receivest, shall be satisfied with knowledge. Grant this, O Lord, for Jesus Christ's sake. Amen.